Quartzsite is famous mostly for being the winter destination of up to 1.5 million visitors, here to escape the cold weather elsewhere in the US; the town has a low, desert location 18 miles from the Colorado River, with daytime temperatures usually reaching the mid 60s (F) even in December and January. Summers, however, see extreme heat for months at a time, and hence far fewer people visit. The town lies along I-10, 128 miles west of Phoenix and 140 miles from Palm Springs, and is also reached by the north-south route US 95, notable for one of the longest sections of dead-straight carriageway in the US (46 miles). 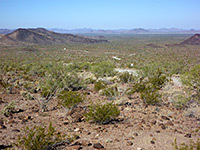 There are several wilderness areas nearby, protecting the rugged mountain ranges in this empty part of the state, and also the larger preserve of Kofa National Wildlife Refuge, the main entrance to which (King Road) is 27 miles south. The Super 8 provides the only chain lodging in Quartzsite, AZ, and it has a quiet location at the west edge of town along the southern I-10 frontage road, one mile from the nearest shops & restaurants - at the Pilot Travel Center near exit 17 of the interstate. South-facing rooms enjoy uninterrupted views across the desert to the cactus-covered slopes of Granite Mountain. The pet friendly motel has low rates but limited amenities - just guest laundry, free internet access, free continental breakfast and free local calls.